Health Minister Simon Harris will bring proposals about the cannabis access programme to Cabinet next month. The licence was granted to a commercial enterprise in January 2019. It is understood Health Minister Simon Harris will bring proposals about the cannabis access programme to Cabinet next month. It’s over two years since the minister announced that a medicinal cannabis access programme was to be established, but since then no scheme has been rolled out. The delay has been blamed on the government running into problems finding a quality-assured supplier of cannabis that can export its products to Ireland. MS Ireland, who has called for medicinal cannabis use for those suffering with the condition, welcomed the news that a supplier had been found, and that the Department of Health is working to finalise the legislation required to underpin the access programme. Aoife Kirwan, advocacy and research officer for MS Ireland, told TheJournal.ie the group is happy that a “regulated and ethically sourced” producer has been found, stating that users will be glad to know that it has also undergone rigorous testing and is safe to use. “It is great to see that the government is now in a place that they can move the access scheme forward,” she said, urging lawmakers to press on with the much-needed legislation. Medicinal cannabis can make such a difference in the lives of those with MS, said Kirwan, who believes the pain relief it provides to people can really make a difference to a person’s quality of life. Speaking to TheJournal.ie, Solidarity–People Before Profit TD Gino Kenny, who has long campaigned for medicinal cannabis use in Ireland, said it is great that a supplier has finally been found, but said “it has taken forever to get this far”. “When the access programme is up and running – that is what it is all about,” he said. Kenny, who introduced his own Cannabis for Medicinal Use Regulation Bill to the Dáil, said the vast majority of TDs want to see the scheme progressed quickly, as it has been an ongoing issue now for two years. “For too long, families have been forced to travel abroad to get cannabis for their loved ones, or have been forced to source it from the black market,” he said. “If legislation passes that will give access to medicinal cannabis, it really will be a momentous achievement for medicinal cannabis use in Ireland. It will give people hope for the future, many of these people who have been fighting and suffering for a long time,” he said. While the news is welcome, he noted there are concerns that even under the new scheme, some people will still not be able to access the cannabis products they need, due to the components some contain. “Every week I have families contacting me, and they are absolutely distraught and have nowhere to turn. Like many other problems, we export it, with these families being forced to travel abroad to fill their prescription for medicinal cannabis abroad. It is just wrong and I get really frustrated when I hear of families having to travel just to get help for their son or daughter,” he said. Until legislation is in place that will allow medicinal cannabis to be imported to Ireland and until the access programme is up and running, Irish doctors continue to operate under the current ministerial licencing route, which allows them to prescribe medical cannabis for their patients. 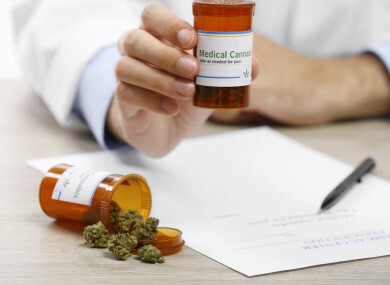 As of late last year, licences have been granted by the health minister for 12 individual patients, the majority of whom are obtaining their medical cannabis from a Dutch pharmacy on foot of their medical prescription. “Once the law is changed, I think it will remove the ‘chill factor’ for doctors who have been afraid to prescribe medicinal cannabis, because they just don’t feel the law is on their side,” said Kenny. Looking to the future, in relation to supply, Kenny said the idea of Irish farmers growing cannabis for medicinal use should be investigated further. Earlier this year, Harris said he would be open to the idea of Irish farmers getting into the business of growing the product for the Irish market, with the Irish Farmers Association also stating that it would be open to talking to the minister about future possibilities of expanding into the market. “It certainly would be very lucrative,” said Kenny, who said there are definite opportunities there for Irish farmers that wish to diversify. He added that like any other product that is being prescribed, if Irish farmers were to grow cannabis for medicinal use, it would have to meet certain standards, such as that of a pharmaceutical grade, so people can be certain it is quality assured. When the scheme is up and running, Kenny said questions about why some conditions are not included under the scheme will be asked. The programme aims to allow access to cannabis-based therapies for a limited number of conditions, such as patients with multiple sclerosis, those experiencing nausea and vomiting associated with chemotherapy, and those with severe, refractory and treatment-resistant epilepsy. “The big question is, why isn’t chronic pain included? That will be the next push, I believe,” concluded Kenny. Email “'Momentous achievement': Campaigners welcome confirmation of government medicinal cannabis supplier”. Feedback on “'Momentous achievement': Campaigners welcome confirmation of government medicinal cannabis supplier”.